When land is scarce and expensive, just build upwards. But it's not that simple... On the economics of skyscrapers. The demand for usable space in urban areas leads to enormous pressure on the price of land and to a compulsion to build upward. But not all metropolises grow upward equally. If high-rise construction is not constrained by regulations, two other factors will govern it: the economics of construction and users' willingness to pay. In 2014, 97 skyscrapers taller than 200 meters were completed worldwide – a new record. What is the attraction of building upward instead of outwards? Compared to a building with fewer stories, a high-rise can offer more rentable space on the same amount of land. The share of land costs to total costs sinks accordingly. The scarcer and therefore more expensive land is, the greater the incentive to increase usable space by building high-rises. But what impact does increasing height have on construction costs? Are there additional economies of scale that make the high-rise construction economically worthwhile? On the contrary: the more floors, the greater the costs of the building structure, facade and installations. The load-bearing structure represents the greatest portion of costs – more than one-fifth of the total. As height increases, so does the weight that the lower floors must support. That means that the design of walls and structures must be more stable. The wind load, which is sixty times greater at a height of 500 meters, requires more wind-resistant engineering. In the 508-meter-high Taipei 101, for example, a pendulum weighing 660 tons is used to compensate for building movements caused by wind. In threatened areas, earthquake resistance must also be incorporated in the construction. The facade contributes nearly as much to costs as the load-bearing structure. It must stand up to wind and weather, and it plays a role in ventilating and heating the building. These aspects, together with safety requirements, mean that special windows are needed. The architecture of the building often requires a specific design for the facade as well. One way to reduce the cost of the facade is to build stories with greater floor space so that the portion of facade costs per story is lower. But the occupants' need for sunlight is an argument against this option. In office buildings, the ratio of facade to floor space is less than 0.5. Residential and hotel multi-storied buildings need significantly more window area. Complex footprints, like the y-shaped Burj Khalifa in Dubai, increase the ratio of facade to floor space, making them more costly. Simple rectangular footprints like that of the former World Trade Center are the best from the perspective of cost efficiency. Skyscrapers pose particular challenges for building services. Transporting water to the upper stories requires pumps on mid-level floors, at the expense of rentable floor space. Heating, ventilation and power distribution all require high-output equipment. 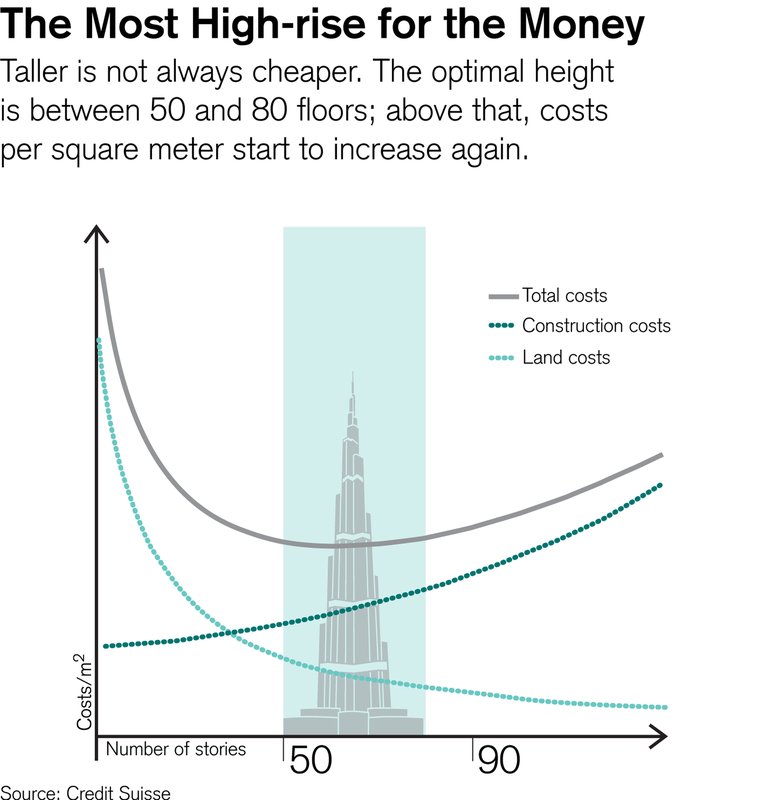 The cost of elevators increases disproportionately to building height. In order to limit transport and waiting times, more and faster elevators are needed. Along with construction costs, floor space efficiency represents another challenge. Every square meter that cannot be rented decreases profits. Elevator installations take up an especially large amount of space, and they are usually located in the core of the building, even when the space they occupy is limited by stacking elevator shafts. In that case, individual cars serve only one block of floors and are supplemented by express elevators. Safety installations such as escape stairwells and elevators for firefighters require space in the core of the building. Heating, cooling, electrical generators and water pumps are usually installed on separate floors, which again requires more space. In today's high-rise buildings, all this usually adds up to around 15 percent. In the end, the space utilization (the share of rentable space to the total) is approximately 70 percent. But for buildings with fewer stories, the figure can be as much as 90 percent. As the height of a building increases, the cost of land falls while construction costs rise, which results in a U-shaped cost structure. Depending on the price of land, wages and materials, the optimum from an economic perspective is between 50 and 80 floors. Many projects exceed these limits, however. Prestige often seems more important to builders than cost effectiveness. Building the more than 1,000-meter-tall Kingdom Tower in Jeddah (Saudi Arabia) is a good example of that – in a region where land is not scarce. 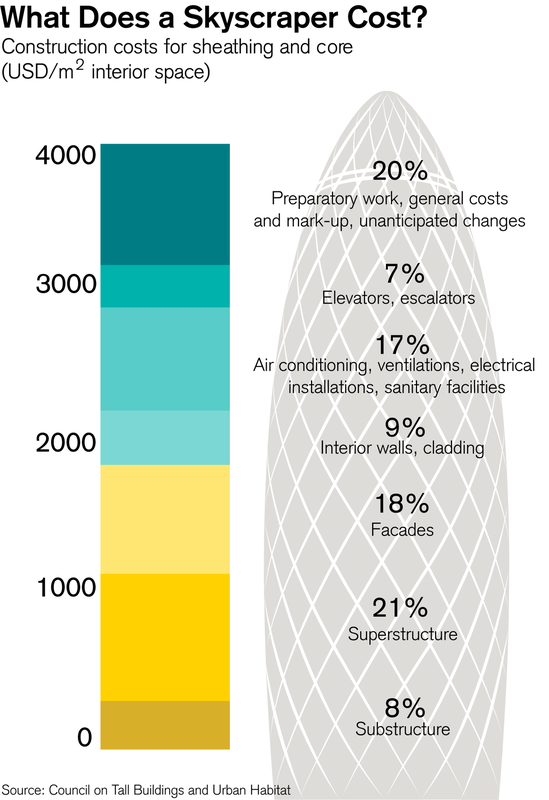 Construction costs for the Kingdom Tower are budgeted at more than USD 1.2 billion. The disadvantages must be balanced by higher return potential. High-rises compete with buildings with fewer floors, so they must offer added value. The skyscraper as a symbol of financial power and the attention it attracts may represent such added value. The Petronas Towers in Kuala Lumpur are one such example, named for the oil giant that is the anchor tenant. Great views from upper floors can also mean added value for residential and commercial real estate, and tenants are prepared to pay the price for that. Height alone cannot guarantee a profit, however. Good accessibility to the location is critical, and unusual architecture – or simply more height – helps to distinguish the building from other skyscrapers. If tenants' willingness to pay matches the higher construction costs, and if building laws allow it, building up, high up, can certainly be worthwhile, even when packed into locations with high land costs. The results are high-rise landscapes such as those in Manhattan, in Hong Kong and more recently in Chinese cities such as Shenzhen and Guangzhou.